A city situated at the base of the western slope of the Anti-Lebanon, in a fertile region. It is the Heliopolis of the Greek and Roman writers, and is famous for the magnificent ruins of several temples—a large one with a vast courtyard; a smaller one (the Temple of the Sun); and a still smaller one, elegantly built in rococo style. The last two buildings, distinguished not only for their large proportions, but also for fine detail work, were probably constructed in the second century; and information from the seventh century indicates that the large temple was erected by Antoninus Pius. In classic literature the first mention of Heliopolis is in the third century; but coins found in the city show that it existed in the first century, when it was a Roman colony. Its origin, however, belongs to a still earlier period, for it was the principal center of the Syrian sunworship. 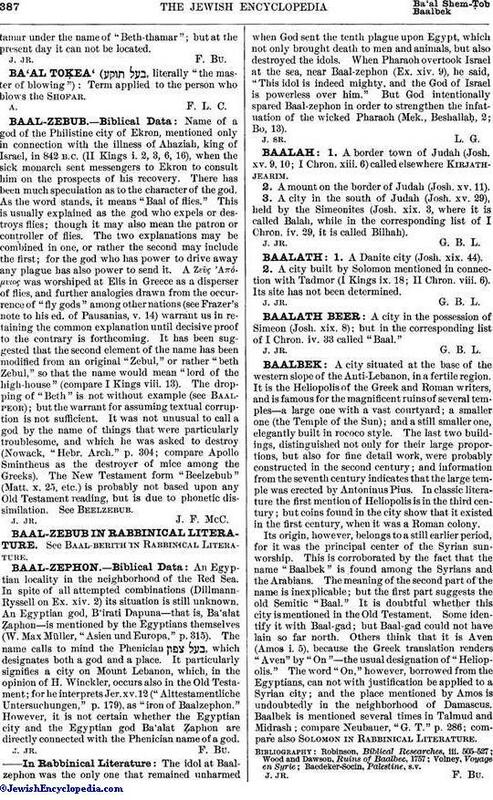 This is corroborated by the fact that the name "Baalbek" is found among the Syrians and the Arabians. The meaning of the second part of the name is inexplicable; but the first part suggests the old Semitic "Baal." It is doubtful whether this city is mentioned in the Old Testament. Some identify it with Baal-gad; but Baal-gad could not have lain so far north. Others think that it is Aven (Amos i. 5), because the Greek translation renders "Aven" by "On"—the usual designation of "Heliopolis." The word "On," however, borrowed from the Egyptians, can not with justification be applied to a Syrian city; and the place mentioned by Amos is undoubtedly in the neighborhood of Damascus. Baalbek is mentioned several times in Talmud and Midrash; compare Neubauer, "G. T." p. 286; compare also Solomon in Rabbinical Literature.